We loved our stick horses from our farm party last summer so much that we decided to re-design a unicorn version! 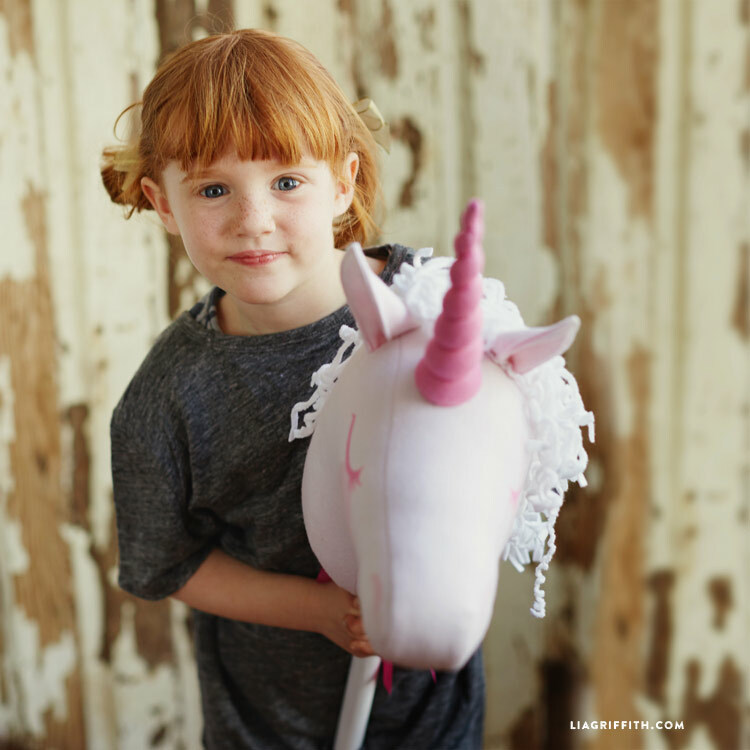 A stick unicorn would be a wonderful birthday gift, or a perfect addition to any princess-themed birthday party, and it is a cinch to put together using our template found on Spoonflower. The template is printed directly onto the fabric, and comes with the designs for the unicorn’s face, ears, mane, and horn. You simply have to cut out the shapes and you are ready to sew your stick unicorn. Head over to Spoonflower to order your unicorn fabric. When ordering your fabric, be sure to choose fleece, otherwise the template will not fit correctly onto the material. To make this project, you will also need extra soft poly-fill and a long wooden dowel that you can find at any local hardware store. When you receive your fleece pattern, cut each piece out according to the template. The square white pieces will be used for mane. Next, prepare your dowel. To prevent any splinters, we sanded the dowel down and painted it with some white craft paint. We painted three coats onto our dowel, sanding it between each coat for extra smoothness. 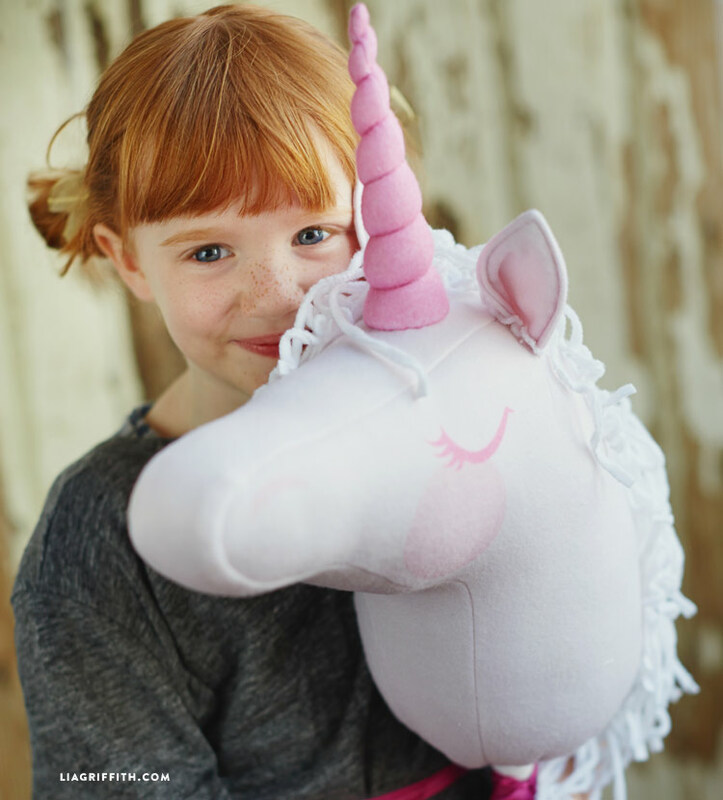 Once you have your fleece pieces and dowel ready, follow along with our complete video tutorial on how to sew the unicorn together! This is a project that is certainly made easier with a sewing machine. 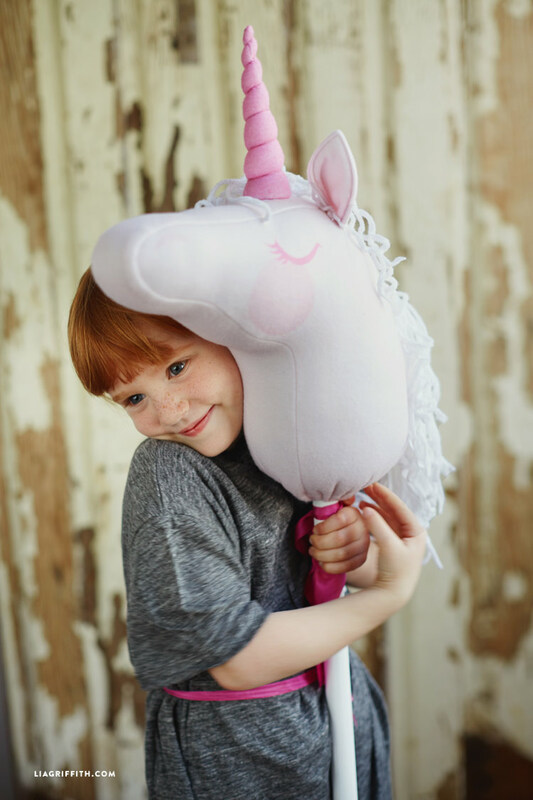 Sew the unicorn’s head, and add the dowel as you are stuffing the head with poly-fill. Sew up the rest of your stick unicorn, and then add your finishing touches! Use embroidery floss to wrap around the horn, and then tie a pretty ribbon at the base where the unicorn meets the dowel. You will also see in the video how we attached the unicorn to the dowel with a simple zip tie, and our easy technique for curling the unicorn’s mane!